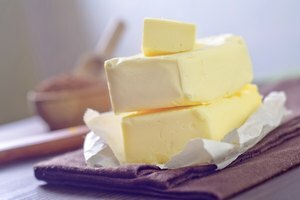 What Is the Difference Between Butter & Sweet Cream Butter? 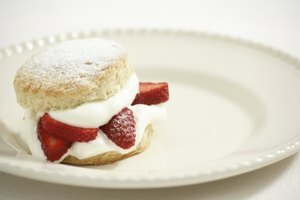 It seems impossible that the only thing that separates butter, a solid, from liquid cream is the mere action of shaking. But that is, in fact, how the magic, that is butter gets made. The only difference between types of butter is how the cream is treated prior to churning. The fat found in heavy cream is condensed in balls of fat, which are surrounded by a membrane, aka small globules. When cream gets agitated or whipped, the whisking action breaks open the globules, freeing the fats. The fat molecules will attract each other and re-condense without the individual membrane's to isolate them. If churned long enough, the fat in the cream will form a solid mass. The remaining traces of milk are rinsed out of the butterfat in cold water and the mass is compressed into a solid lump or brick of butter. The butter we all know and love is of the sweet cream variety. Sweet cream butter is made from butter that is fresh and sweet tasting, rather than aged and tart. The end result is butter with a light, uncomplicated flavor that is well-suited for table use or baking. France and other European nations have a different approach to butter-making. In these countries, the cream is lightly soured by a bacterial culture (similar to the one used in America to make buttermilk) before it's churned. Cultured butter has a more pronounced, "cheesy" quality. Cultured butter is an excellent choice for artisan breads, pastries, and other rich baked goods. Sweet butter, although an outdated term, is used to differentiate between salted and unsalted butter. Since salted butter was by nature slightly savory, that made unsalted butter sweet in comparison. The term has no bearing on whether the butter is made with cultured or sweet cream, it merely refers to the presence or absence of salt.